I’m smack dab in the middle of yet another home improvement project. This time we’re tackling the dining room and we’ve removed the old wallpaper, spackled, sanded and started to paint. One of the big differences from this project and the last one is the type of primer and paint I’m using. Low odor, low VOC paint is the way to go! If you read my 3-part post on my DIY bathroom re-decorating project then you might remember that the fumes from the primer I used just about knocked me out. That was THE last time I’ll ever use that exact type of primer. Moving forward I’ve decided not to use any type of paint or primer that isn’t low or zero VOC or at the very least of the low odor variety. VOC is an acronym for Volatile Organic Compounds. What’s the difference between low odor/odorless and low/zero VOC paint? The difference is…well…if you have a paint that is low in VOCs, it will be low odor. The lower the VOC, the lower the emissions generated by the product over time and at the time of application. There is practically no reason why you shouldn’t be using zero or low VOC paint and/or primer these days. The formulations have improved dramatically over the past 10-15 years that allow lower VOC paints to compete with/beat their high VOC counterparts. I used two different types of low-odor paint and a low-odor primer for the dining room project. The Zinsser B-I-N Shellac-Base Primer Sealer Stain Killer was the killer for me on the bathroom project and no wonder. The VOC content was 550gm/l!!! This time I used Valspar High Hiding Primer with low odor characteristics. I am using up the Behr Premium Plus Interior Semi-Gloss Enamel paint that I purchased within the past year for the bottom half of the walls so it wasn’t low VOC paint. I wasn’t making a conscious decision to buy low or zero VOC paint at the time that I purchased the Behr. 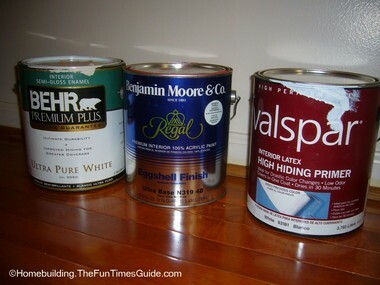 However, the Benjamin Moore Regal Eggshell Finish Acrylic Latex paint is low odor, low VOC. Glossy paints contain more solvents than flat finishes. The VOC content in a flat paint may be just 50 gm/l (grams per liter), while glossy paint could be as high as 200 gm/l. The tints added to create color also contain VOCs. In order to be classified low VOC, a paint must have levels lower than 100 parts per gallon. In general, flat paints, low luster-paints, eggshells, and pastels have lower VOC levels than bright, high-gloss paints. I found the VOC content by going to the manufacturer websites, finding the type of paint I had bought and clicking on the Material Safety Data Sheets (MSDS) link. (Obviously, you can do this before you buy it, too.) The MSDS link provides all of the scientific data, health hazard data, VOC content and much, much more. It is the ‘down and dirty’ for sure. Where Can I Go To Research “Green”, Eco-Friendly Paint? Look no further than right here, of course. Just go to the link(s) I’ve supplied below for some very detailed information regarding MPI Green Approved paints/coatings. MPI Green Approved Products List: Click on the MPI category number or product to search their database for low VOC paint and covering products. You can also key in the MPI category code if you know it (see below). This VOC Requirements table supplies all of the MPI category codes that you key into the green-approved products search box to find your particular type of paint/covering. Only then will you realize whether or not your brand/type made the MPI green-approved products list. Just make sure you are in the correct category before coming to the conclusion about the paint and/or covering you’re researching. Please note that MPI does not necessarily seek out brands and types of paints. If the brand you’re interested in isn’t listed in the manufacturers list then they haven’t contacted MPI for evaluation of their products. The MPI green-approved products list is updated every six months. Coatings manufacturers must contact MPI to have their products evaluated and listed with all sorts of good data for you and me…the consumer. For instance, the following link shows all of the Interior, Latex (Gloss Level 3) products that are green-approved by MPI. Here’s the MPI Gloss and Sheen Level standards link. The Benjamin Moore Regal paint I used has an EPR rating of E2. E2 denotes a VOC content between 101g/l – 150 g/l. This qualifies as meeting the GPS-1-07 standard (GPS stands for Green Performance Standard). If my paint had a rating of E3 it would signify that it meets the higher standard (GPS-2-07) of VOC content of less than 101g/liter required for Latex, Interior, (MPI Gloss Level 3). You should also note that MPI Green Performance Standard (GPS-2) provides for a maximum allowable limit of 50 g/L of VOCs. It all gets pretty technical but at least there is a list for every type of paint and/or covering available for you to look at before buying. The key is deciphering the list and what it all means in relation to your particular brand/type of paint or coating. Here’s the link explaining the MPI Green Performance Standard (GPS-1-07 and GPS-2-07) for Paints & Coatings. Just Give Me The ‘Down & Dirty’ On VOC Paint! This is “The Fun Times Guide To Homebuilding” and this kind of technical info isn’t “fun” to me but it is very important to all of us and in particular…our environment. If you’re a regular Joe looking for a low VOC top coat (interior/exterior paint), ask the sales associate for the VOC content on the brand/type of paint you want. If it’s 100 gm/liter, or less, you’re holding a low VOC product in your hand. If the VOC content is 50 gm/l, or less, then you’re holding a very low, eco-friendly product in your hands. That’s the bottom line. Now if you’re in the market for products other than paint such as coverings, sealers, varnishes, lacquers, primers, etc. then you should consult the MPI category list and then key the code into the MPI green-approved products table. The maximum allowable VOC content changes dramatically for coatings other than paint. And you thought the hardest part about choosing paint was picking the color! Here’s a handy list of MPI definitions for whatever type of paint and/or covering you are researching. The U.S. Navy has integrated the MPI Standards into their procurement procedures.